University of Southampton researchers are helping to unearth new information on extreme objects known as ultraluminous X-ray sources (ULXs). A new study, led by California Institute of Technology (Caltech), has revealed more information about ULXs and data acquired from NASA's Chandra X-ray Observatory has helped to identify a fourth ULX as a neutron star – the first in in the Whirlpool galaxy, also known as M51 – and found new clues about how these objects can shine so brightly. Dr Matthew Middleton, of Physics and Astronomy at the University of Southampton, said: “Neutron stars generate magnetic fields – a bit like a bar magnet – but much stronger than anything we can create on Earth. This magnetic field can have a major influence on the way in which material, pulled from a companion star, makes it to the neutron star’s surface and emits X-rays along the way. "Gaining insights into the nature of the field around neutron stars – especially those in ULXs - is a key goal for the community and this discovery is one major step towards that goal." In the 1980s, researchers began discovering extremely bright sources of X-rays in the outer portions of galaxies, away from the supermassive black holes that dominate their centres. At first, researchers thought these ULXs were large black holes with more than ten times the mass of the sun. However, discoveries in 2014 from NASA's NuSTAR and other space telescopes have shown that some ULXs, which glow with X-ray light equal in energy to millions of suns, are actually neutron stars – the burnt-out cores of massive stars that exploded. The gravity of neutron stars pulls surrounding material from companion stars onto them and, as this material falls towards the neutron star, it heats up and glows with X-rays. However, as the neutron stars feed on the matter, there comes a time when the resulting X-ray light pushes the matter away. Astronomers call this point – when the objects cannot accumulate matter any faster and give off any more X-rays – the Eddington limit. 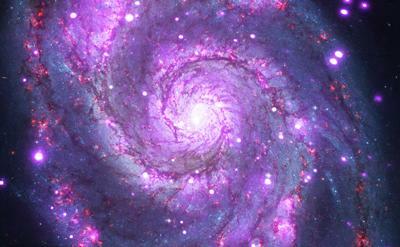 In the new study, titled ‘Magnetic field strength of a neutron-star-powered ultraluminous X-ray source’, the researchers looked at a ULX in the Whirlpool galaxy, also known as M51, which lies about 28 million light-years away. They analysed archival X-ray data taken by Chandra and discovered an unusual dip in the ULX's light spectrum. After ruling out all other possibilities, they determined that the dip must be from a phenomenon called cyclotron resonance scattering, which occurs when charged particles – either positively charged protons or negatively charged electrons – circle around in a magnetic field. Black holes don't have magnetic fields and neutron stars do, so the finding revealed that this particular ULX in M51 had to be a neutron star. Cyclotron resonance scattering creates signatures in a star's spectrum of light and the presence of these patterns, called cyclotron lines, can provide information about the strength of the star's magnetic field, but only if the cause of the lines, whether it be protons or electrons, is known. The researchers don't have a detailed enough spectrum of the new ULX to say for certain. If the cyclotron line is a result of circling protons then the magnetic field strength would be extremely high – amongst the highest field strengths detected for neutron stars. In contrast, if the lines are from electrons, then the magnetic field strength would be far weaker and the way matter makes its way to the neutron star very different. To further address the mystery, our researchers are planning to acquire more X-ray data on the ULX in M51 and look for more cyclotron lines in other ULXs. "The discovery that these very bright objects, long thought to be black holes with masses up to 1,000 times that of the sun, are powered by much less massive neutron stars, was a huge scientific surprise," said Fiona Harrison, Caltech's Benjamin M. Rosen Professor of Physics and the principal investigator of the NuSTAR mission. "Now we might actually be getting firm physical clues as to how these small objects can be so mighty."